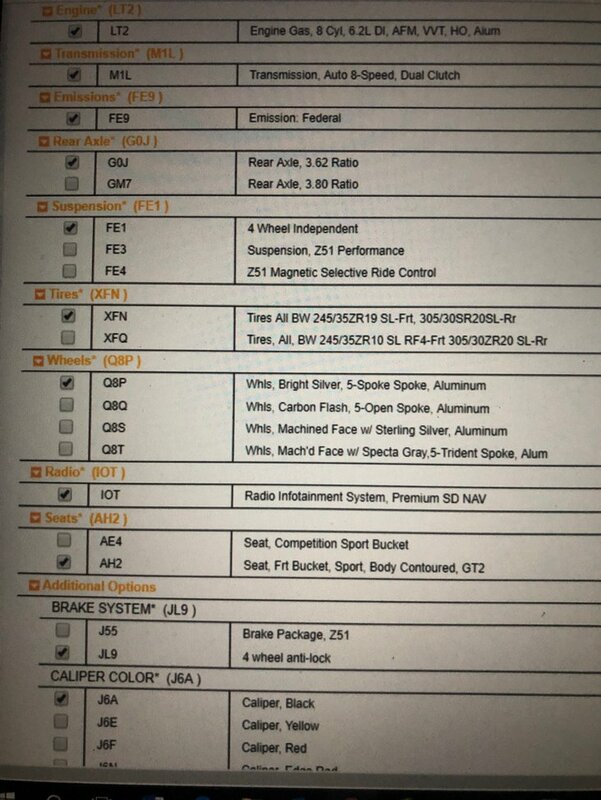 The user of a Chevrolet Corvette forum recently shared photos that claim to be options list for the upcoming eighth-generation C8 Corvette, which is anticipated to make the mid-engined leap. 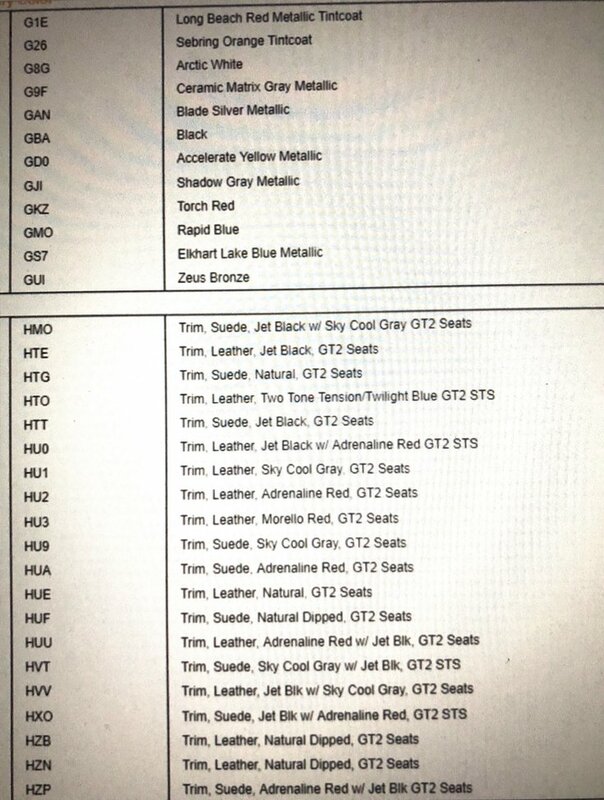 User NBVette4U of CorvetteForum.com, who claims to be an employee at an unnamed Canadian Chevrolet dealership, recently posted several photos of options lists that they allege to be dealership-only documents for the C8 Corvette. He claims that the documents depicted have been issued to all Canadian GM dealers and that basically, any employee can access them. 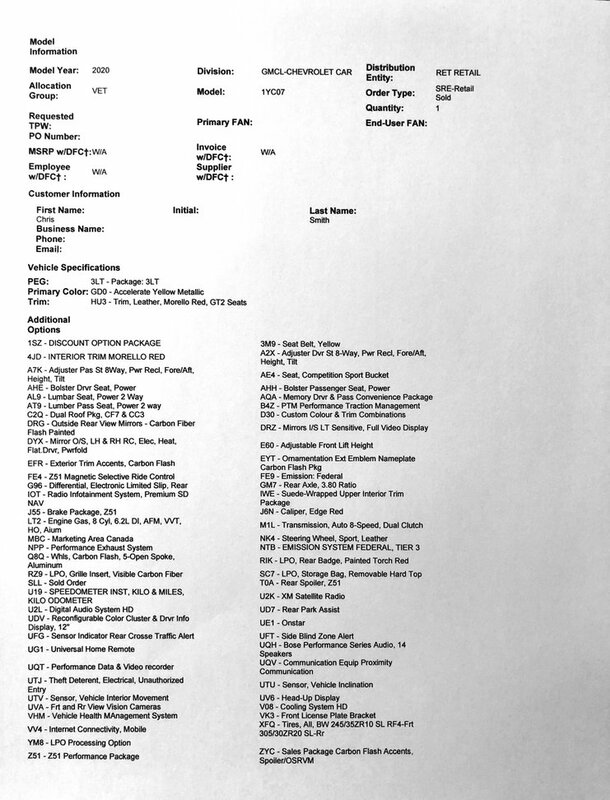 "Any Canadian can walk into their local Canadian dealership and it's all there for any employee to pull up on GM workbench," claimed the user, who seems to have filled out the alleged order form under the name Chris Smith. According to these lists, the first model year for the C8 will be 2020, which is in line with rumors that have so far suggested that the car will be revealed in 2019. Twelve paint colors and at least twenty interior material and color combinations will supposedly be available, as well as a choice of multiple roof specifications. Power is claimed to come from a naturally aspirated 6.2-liter "LT2" V-8, paired to an eight-speed, dual-clutch "M1L" transmission with optional rear axle ratios of either 3.62 or 3.8:1. Pricing information is alleged to be unavailable at present, and no performance information was included. A few details about this post, however, stink. For starters, all of the images are off-screen photos, rather than screenshots, so there is little evidence supporting this poster's credibility that the photographed screen belongs to a GM dealer. Small formatting inconsistencies and typos throughout make these look not like authentic corporate documents, but an amateur imitation, and this isn't helped by the non-descriptive list of paint colors. 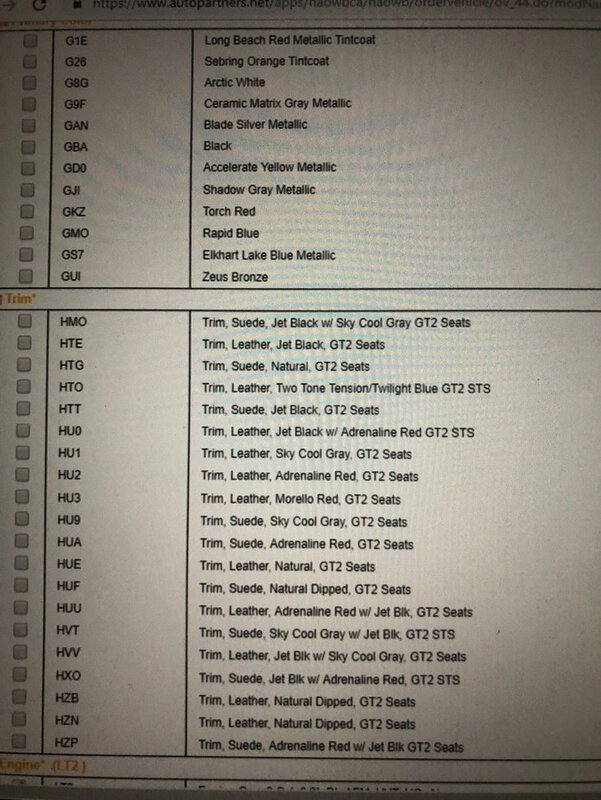 "Rapid Blue," "Zeus Bronze," and "Black" don't sound like the oft-embellished names of automotive paint colors. There's also no mention of the top trim level's reported twin-turbo V-8, one so powerful that it warps the C8's frame—a claim from a more reputable source than a forum. There are enough instances of undecipherable abbreviations or dealership-like jargon to make them look like official GM dealer materials, and the user's post history suggests that they are at a minimum a big-spending Chevrolet customer, if not a dealership employee. Regardless of their personal credibility, there's enough fishy with the posted photos that you're better off taking this purported options list with a grain of salt the size of Bowling Green, Kentucky. With dealer stocks of the current Corvette reaching an uneasy high of more than 9,000 cars, it wouldn't be an opportune time for GM to reveal the C8. But if the ball's already rolling, GM may have no choice but to go for a fire sale on C7s in advance of the hot new C8's debut. Dealer inventory of the C7 Corvette continues to stagnate while sales dwindle in anticipation of the C8.